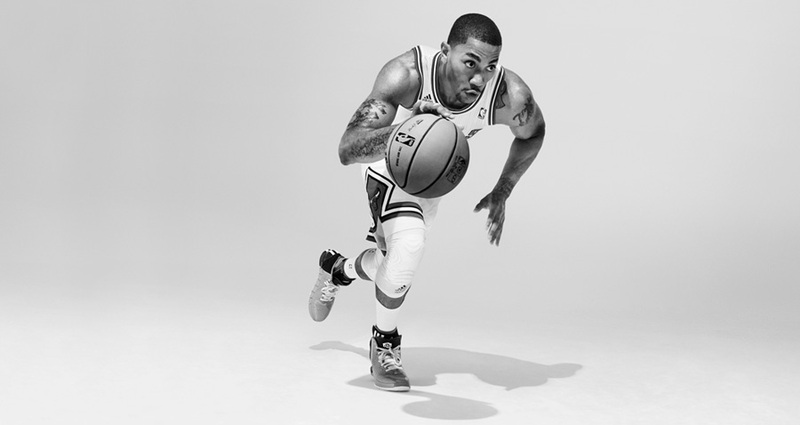 DRose is back at this season, and adidas category footwear manager Jack Gray breaks down every detail of his newest shoe. 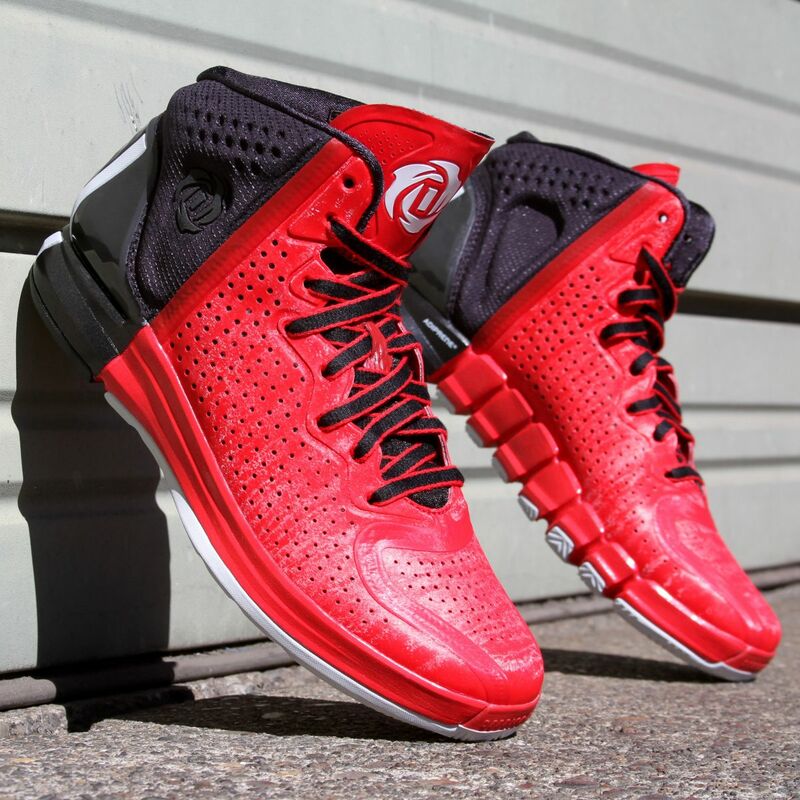 As you know, Derrick Rose is about to return. The explosive game, the MVP-level performance and the Eastern Conference thrashing team is ready to be back at it. "I can still do this," Derrick recently reassured. 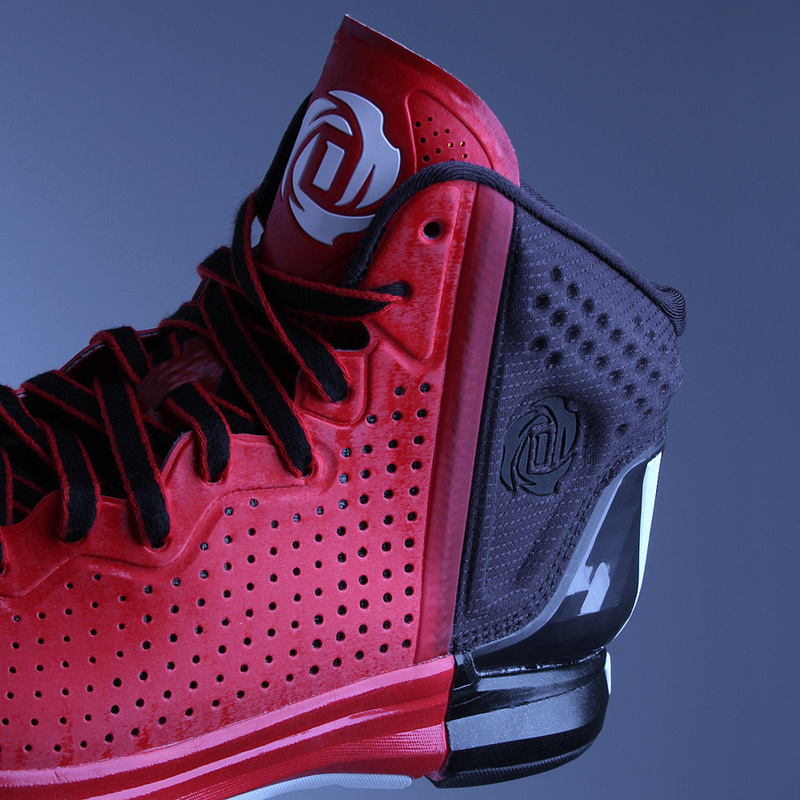 As he kicks off his return in the coming weeks, he'll be hitting the hardwood in his new adidas D Rose 4, which features a can't-miss court view and all of adidas' latest innovations. 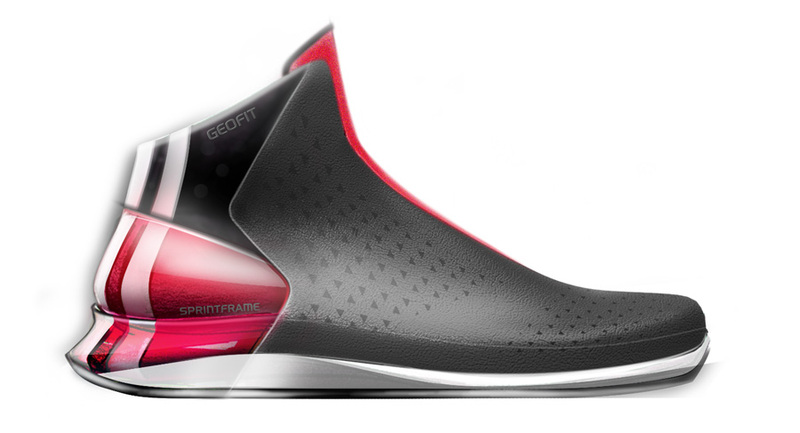 Designed by Kohei Kanata, the shoe features a literal split through the collar to help tell a duality story of Derrick's off-court style and on-court performance. 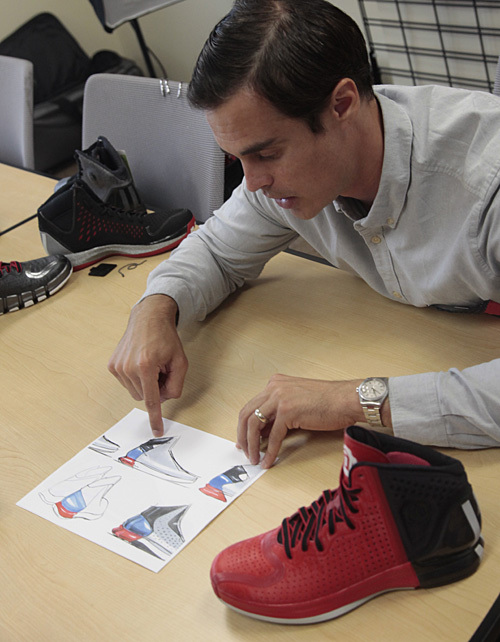 We recently caught up with adidas Basketball Category Footwear Manager Jack Gray to dive deep into the shoe's many details, tech specs and material executions. 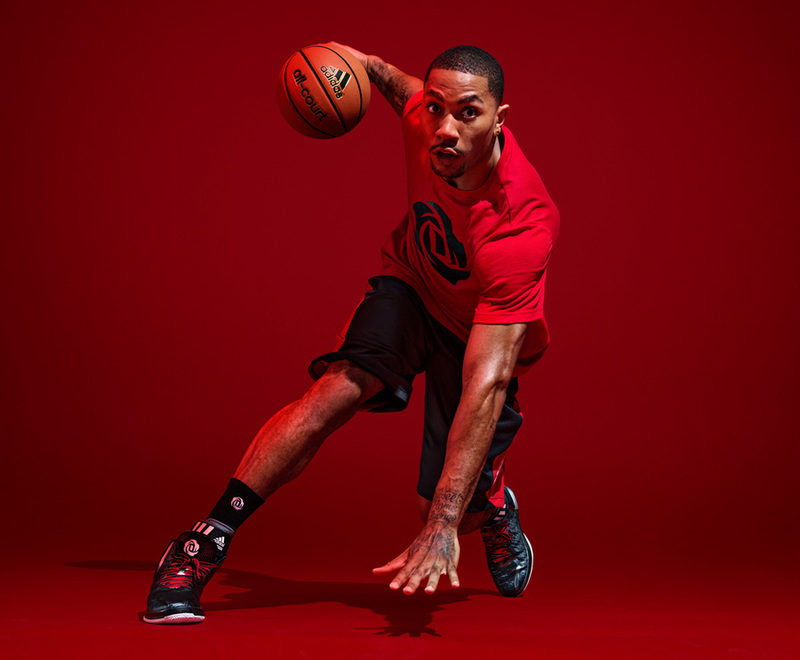 Read ahead for an exclusive look at the new DRose 4, releasing worldwide on October 10th, and be sure to follow us on both Instagram and Twitter for live updates throughout the day from Chicago's launch event. Nick DePaula: Coming off of the Rose 3, it seems like there was more of a focus to have a distinct court block here. What were some of the big picture things you guys wanted to get after? Jack Gray: It really starts with Derrick. It starts with him and where he is in his life. The process started eighteen months ago and we knew that we had to come with a product that spoke to who he is and really tell that personal story. The first of the two big things was, “How do you talk about his demeanor?” We always talk about the two sides of his personality, but how do you do it in a literal way? We wanted to have both the on-court explosive style of his game, and then also the off-court style of his. A lot of people might not see those things, and not everyone reads interviews all the time, so we wanted to have a very literal translation about these two sides. You'll see a little bit more of a fashion-forward look and style in the front half of the shoe, and we brought in a lot of bonded details that you'll see on higher end technical apparel. We have a Sprintweb construction again, but it's clean and all in one zone. 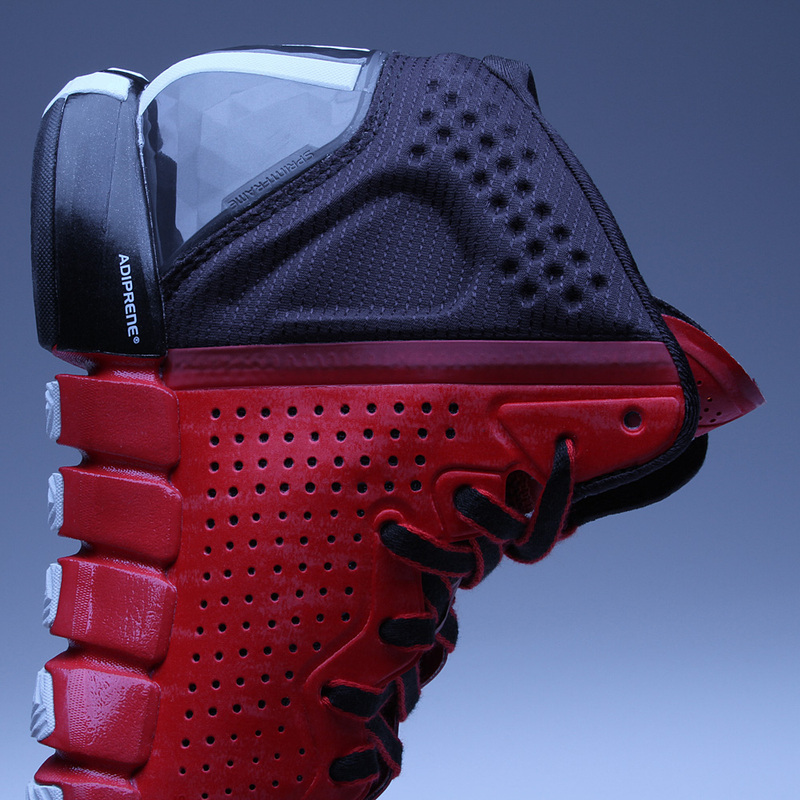 Then, the heel is really more about performance and being technical. 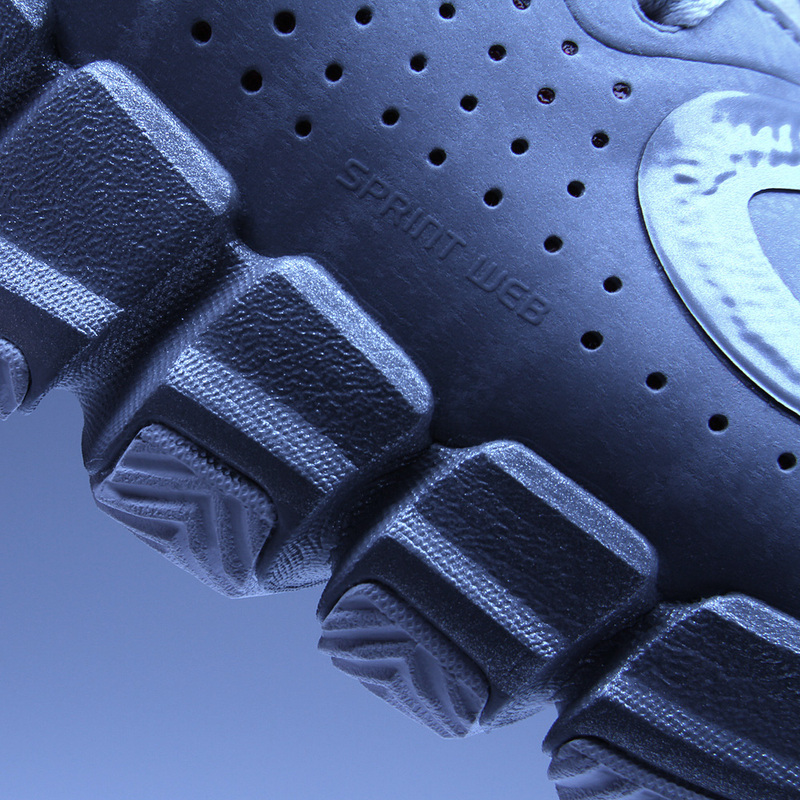 We have the Geofit around the ankle, which is a completely molded collar for comfort. 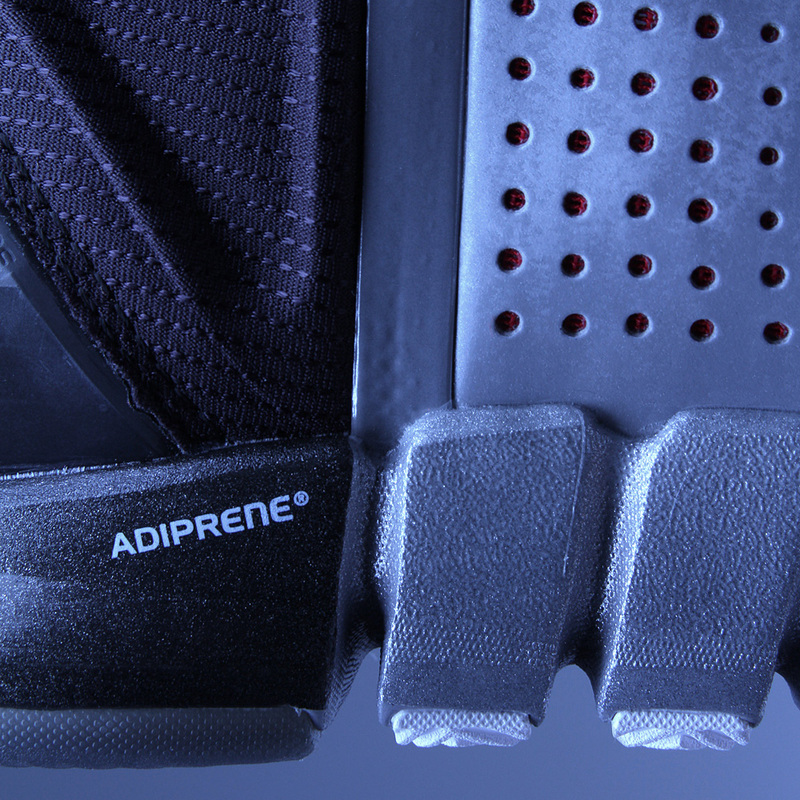 We have the Sprintframe heel counter, and then also a really nice adiprene+ heel unit for extra cushioning. One of the biggest components for how we look to improve the product is making sure we're providing the Quick benefit. We knew that Crazyquick is a great platform and big innovation for us, and speaking to his game, we wanted to have a product that will enhance his quickness. Derrick is both fast and quick, and we wanted to do it in a way that aligns his ankle and knee in such a way that allows him to be quicker and enhance his performance. We didn't want to just take a Crazyquick one for one and drop that platform here. We wanted to do it in a truly Derrick way. When we talk about the two sides of his personality, you'll see the cleaner sidewall on the lateral side and some luxury detailing, and then once you flip it to the medial side, you'll see the Quick benefit more exposed. 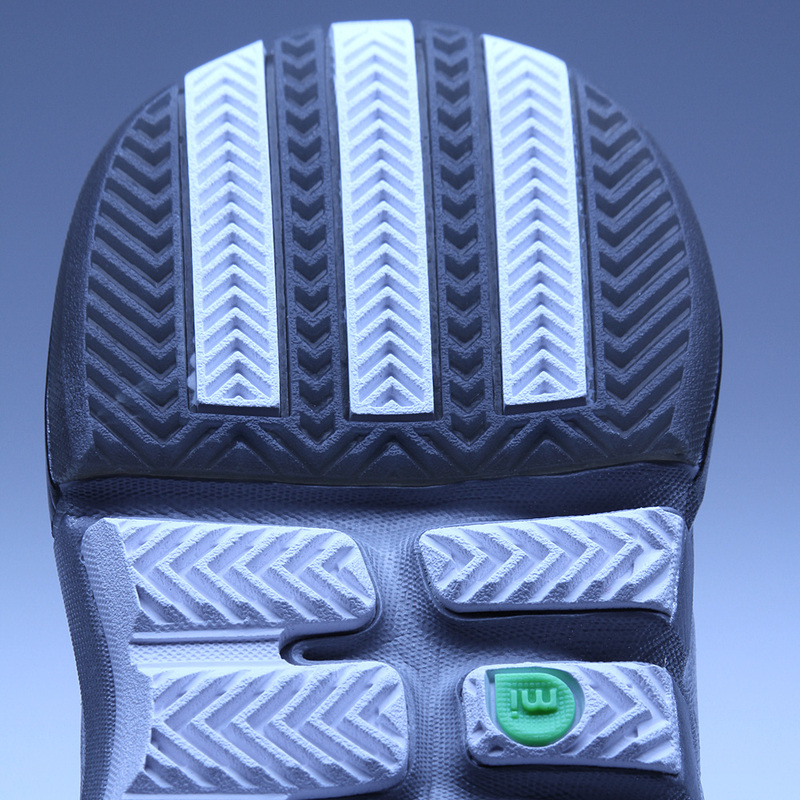 For a lot of the Quick benefit, you don't necessarily have to have the entire outsole completely decoupled. You can have the segmentation on the medial side and that provides a lot of the benefits. We wanted to just do it in a Derrick way. NDP: There's a bit more rubber on the lateral side here on the outsole. Did any of the learnings from the Crazyquick lead to that, in terms of there being too much flex for Derrick's game? JG: A little bit of that comes into play, but whenever we talk to him, we always have the discussion of filling in the medial side around the arch. He wants more support and less flex on the platform, and that's something that we've done for all of his shoes. You'll notice on the 3 and 3.5 that we filled in the arch a little more. In terms of support, we also know he wears the SpeedWrap, and we wanted to make sure we could improve upon the Geofit collar so that it works for him but then is also comfortable and supportive for someone who isn't wearing a brace. The 3D molded EVA collar really shows the idea of support. NDP: As he was going through all of his rehab last year and working to get back, was there anything in what he was looking for in his shoes that had changed? JG: We were down in LA where he was training, and talking to him, a lot of the things that he talked about was how he wanted to improve his game and how he wants to be quicker than before. He was putting on a ton of muscle and really working on his range of flexibility. That's where the idea of stability comes in, along with having more support. He really looks to the heel of the shoe in terms of having the support and lockdown, and he likes having a more stable platform. With his style of play, we looked at it as a holistic concept and not just necessarily slapping it on from the Crazyquick. 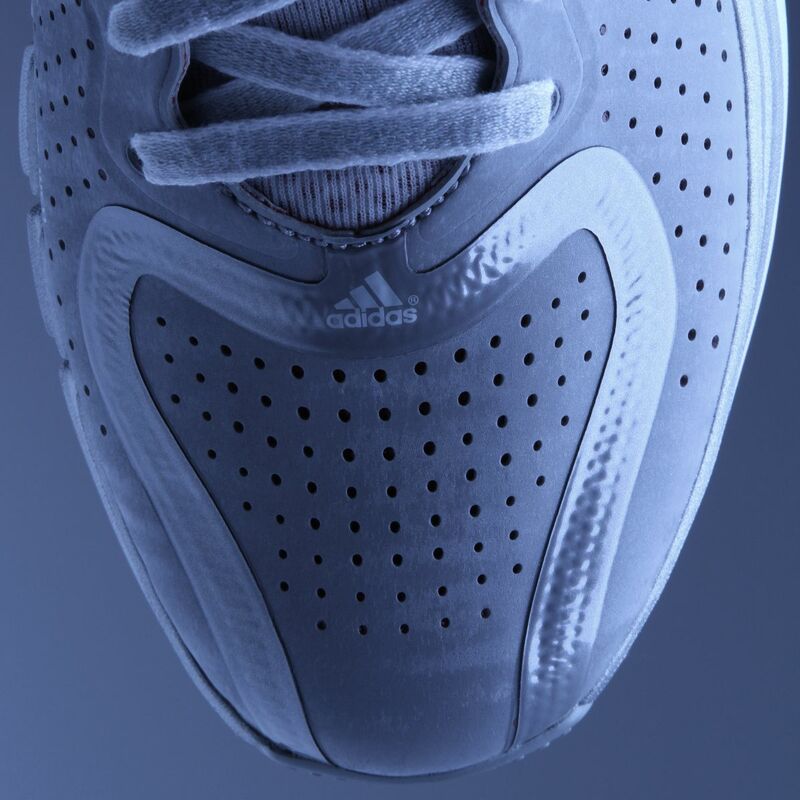 NDP: The Sprintframe is only visible in the heel, but does it extend all the way through the shoe like in the past? JG: It extends a little into the midfoot, but it's not completely full-length like in the past. We wanted to really provide that midfoot support, but do it in a beneficial way. We didn't want the Sprintframe to extend too much on this shoe since we have the Quick outsole through the forefoot, and wanted to make sure that you're maximizing that. We wanted to make sure we have the lockdown in the collar and midfoot, and then that quickness and freedom up front. When you have a very literal split, we have a very purposeful point of view on the shoe. The Sprintframe is an integrated part, and then doing the SprintWeb in a way that's not like the Crazy Light and is more stylish was real big. One of the things I love about working with Kohei is that he's always got this overarching concept. 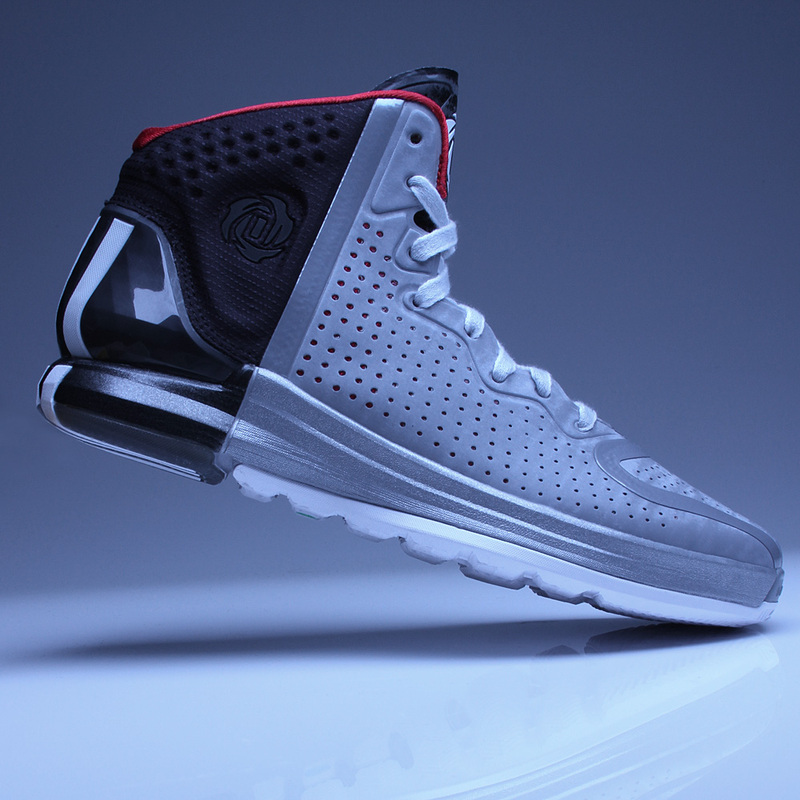 When you bring the idea of two sides to Derrick as a player and person, I think this shoe really encapsulates that. NDP: The materials are a lot more varied this year. Can you talk about the different zones of the shoe? JG: The material mix is really important too. There are bonded details, and then you'll see stitching details underneath those layers. 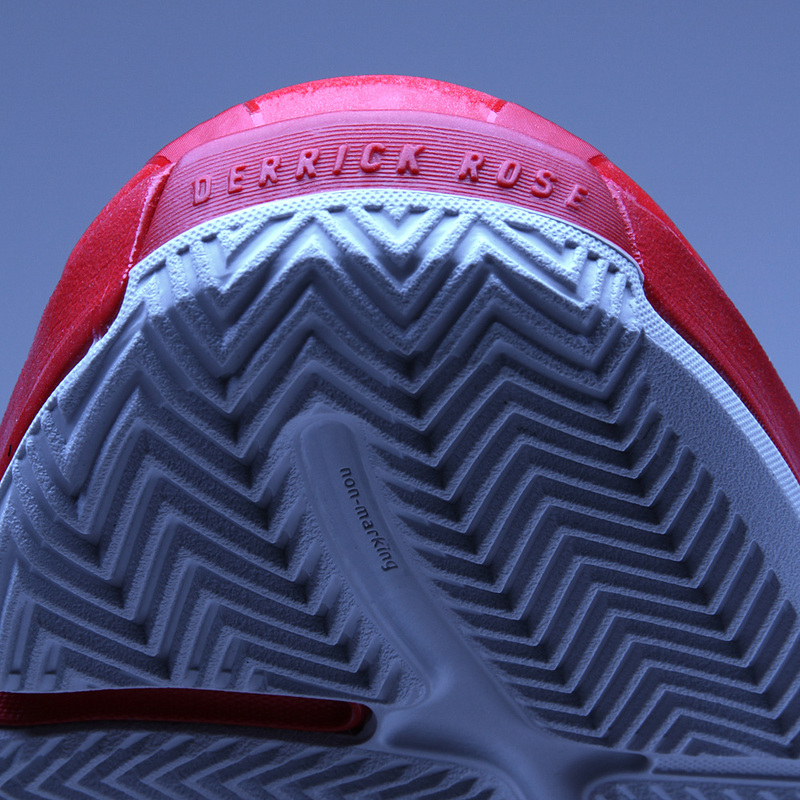 We also wanted to free up the stitching on the side of the toe box to allow for less distractions. Even the materials themselves are more thought out. It's not just a straight black shoe, there's a charcoal look, and then there's different textures throughout. Everything looks a little different. We have two-color laces, and then also some matte and shine detailing. The collar has the pinstriping details from the alternate uniforms, and then we also wanted to continue to have the 3M detailing on his logo. There's always the aspect of two, that you'll see throughout the whole model. NDP: What were some things that shifted along the way with the design from Kohei's end? JG: The idea of the two sides of his game was the general direction. Our brief was, “How do we take one of the most explosive players in the game and offer him a performance enhancement that's a little more literal?” The progression of the 3 to the 3.5 goes from clean and fashion-forward to aggressive and really bold. We know that with Derrick coming back and how he's going to play, we wanted to merge that street performance concept right off the bat. We wanted to have a literal tieback here, and you can see in the evolution of the design, that he went with a very geometrical perf pattern at first. That's kind of what you saw on the 3.5, and that was that shoe and this is a wholly different shoe, so we flipped the direction a little from that and went with more circular perfs instead. At one point, we had a more wavy design, and Kohei wanted to make it more purposeful and distinct, so he went with the straight line to just really tell the two stories. 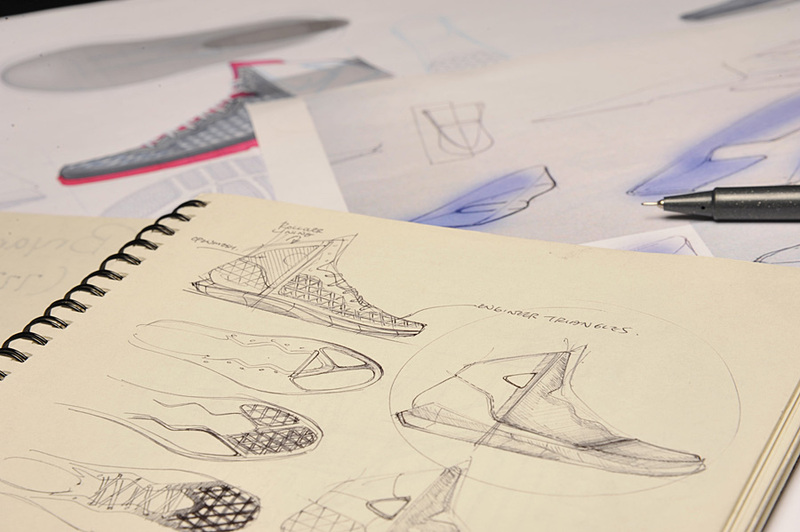 The general idea of the branding staying along the heel, having the Geofit and Sprintframe story in the heel and then a clean forefoot was really consistent throughout the whole process. The pattern was always pretty drastic from the side, and then another focus was the toe down, because we know how important that is for Derrick. The wearability is obviously a big thing. NDP: Something that we saw last year, while Derrick wasn't playing, was guys around the league wearing his shoe and also colleges wearing it. Will we see that again now that he's back, or will he be the only guy wearing it? JG: We'll definitely have our college guys wearing the shoe, but for the pros, I think that was just a thing while he wasn't playing where guys could support the shoe. Now that he's getting on court for the first time in a year, we want to keep it special for him. You won't see a lot of guys wearing the 4, and you may see in the back half of the year some guys wearing the 4.5. Right now the focus is really just on Derrick though. NDP: Derrick and my main man Tony Allen. He'll probably have some basic version he does on miadidas.com or something. NDP: So when he comes back for his first game, which I think is in Rio, are you guys going to throw a huge party here and all watch together or what? JG: I'm sure we'll have people out there at the game too, and we'll definitely all be watching here. I think that first game in Chicago is something we'll all be at. They're playing Miami on the road to start, and then two days later play the Knicks at home. It's great that he's been on this world tour and we're all really excited as the season gets closer here. He was able to actually check out our Germany headquarters, and we have this awesome photo of him in the archives holding up Jesse Owens' track spikes. He's really been digging into the history of who our brand is, and the effect that a guy like Jesse Owens has had on sport. NDP: Last year, the shoe was $160, and here you guys have moved down to $140. Why the change and how big did that discussion get to bring the price down? JG: I think we looked at the market value and how the product fits into the overall landscape. Whether it's $140, $160 or $180, we think the product holds a ton of value and speaks to who he is, but we always make business decisions based on the market and what the best way to support Derrick as an athlete is. We made that decision to bring it down a little, even though it's still a really signature and iconic piece for him. One of the things for Derrick is that whether he was playing or not, he was still in the top 5 for jersey sales. The 773 model right now is also smoking at retail. So there's an appetite for Derrick's product. NDP: And they'll all be $140? Last year you had the two tiers of both $160 and $180. JG: Yeah, they'll all be $140, and we'll have one tier throughout the season. NDP: In terms of weight, I know he's not too concerned about that and is more focused on support. Where'd you guys end up though and how much do these weigh? JG: We're at 12 ounces, so it's still very lightweight. 12 ounces is definitely in the light realm, and one of the challenges with weight is that we want to have a lot of value in the product, and sometimes the treatments and nice materials can weigh a little more. We don't want to have a ton of cutouts on the upper and he's really into the wearability too. Weight isn't really a big thing for him and of course he wants a light product, but things like fashion, quality and support are really big as well. When we specify our weight goals early on, we aren't looking at something that's 9 or 10 ounces like the Crazy Light. We definitely don't want to make a brick, and everything has to be lightweight, but something around 11.8 ounces is perfectly fine. NDP: Lastly, how excited are you to see your dude back on the court this year? JG: Man, we've obviously been working really closely with him, and we've been around the world with him on his tour and then also in LA while he's training. 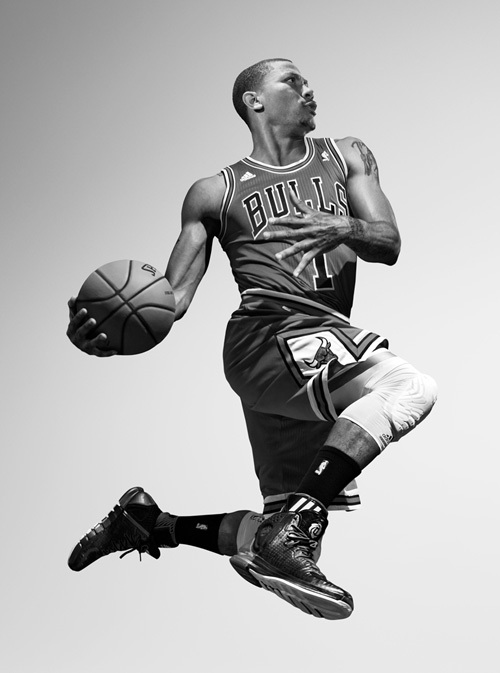 Our excitement really matches what the fans and consumers are feeling, and we're excited that we have a product that speaks to his fashion and performance, and we're really excited for him to come back and take the Bulls to a championship.